Have you ever wondered what it’s like to be a dog walker? Or are you looking at hiring someone to walk your pups and want to know a little more about what they do? We quizzed one of our beloved dog walkers Jane, and we now understand why she loves her job so much! You can read her answers below, and if there are any other questions you’d like to ask, feel free to contact us. What inspired you to become a dog walker? I love to exercise and I adore dogs! Being outdoors, walking puppies for a job while others are stuck inside a building behind a desk makes me feel very lucky to do what I do. What does a typical day look like for you? Most of our dog walking visits are around lunchtime. This is mainly to benefit the dogs – it’s best to break up their days while their owners are at work, and this means that they usually don’t spend more than 4-5 hours by themselves. The rest of our days are filled with dog grooming and washing jobs. Generally we walk 2-3 dogs together, just depending on their size and strength. If you would like your dog to be walked on its own, or have more than one dog for us to walk, feel free to contact us and we can tailor our service to your needs. 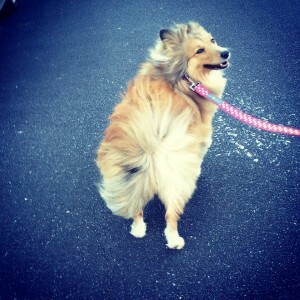 How often do you walk dogs for Rosie Pets? We have regular dog walking clients every week day and then a mixture of irregular and regular clients on weekends. We can also walk your puppies when you go away for holidays, just make sure to book in advance to secure a spot. Where are some of your favourite places to walk in Brisbane? I love walking along the river at Graceville or the leafy suburbs of Chapel Hill (the dogs love it too!) Dog walking in Brisbane is especially wonderful, as the weather is generally fine all year round. You get paid to do something you love!